NEW YORK—For the better part of the 1990s, millions of Chinese gathered on a regular basis to do the slow-moving, meditative exercises of Falun Gong or studying the teachings of the spiritual practice’s founder, Mr. Li Hongzhi. An abundance of photography and literature documents the extensive spread of Falun Gong, also known as Falun Dafa. 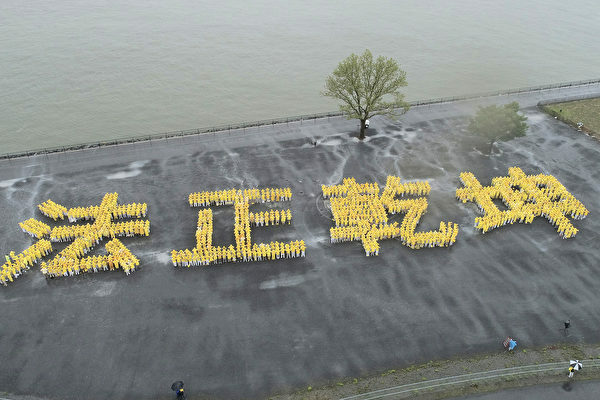 On May 13, a quarter century to the date that Mr. Li gave his first Falun Gong lecture in an austere Northeast Chinese classroom in 1992—and nearly 18 years since the beginning of a brutal communist persecution ordered by regime leaders—3,300 adherents hailing from multiple countries gathered in New York to form a set of words in celebration of the moment. Falun Dafa teaches spiritual cultivation according to the principles of truthfulness, compassion, and tolerance. With a mind to Falun Gong’s ancient roots in Buddhist and Daoist traditions, practitioners follow these precepts in their day-to-day lives, striving to be better people. And a set of five meditation exercises keeps them healthy, as experienced by the 1999 estimates of 70 to 100 million Falun Gong practitioners at all levels of Chinese society and for hundreds of thousands of people who took up the practice overseas. Despite costly and bloody efforts by the communist regime to eradicate Falun Gong in mainland China and defame it around the world, tens of millions of people are estimated to continue the practice underground in China. Meanwhile, Falun Gong practitioners and groups can be found in about 100 countries on all inhabited continents. Decca Wirywan, an Indonesian practitioner working in Qatar, said he had benefited immensely from Falun Gong in terms of physical and mental health, and was excited to take part in the character formation, despite the presence of rain and strong wind on the day of the event. Anita Hermawan, also from Indonesia, said she had very poor health and was reduced to taking dozens of pills a day before she learned about Falun Gong from her friend Wirywan. 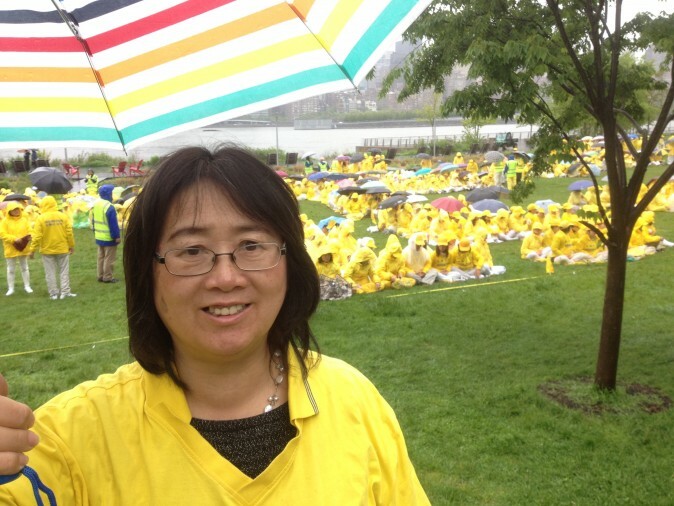 “After I started practicing Falun Dafa, everything went away,” Hermawan said of her symptoms. 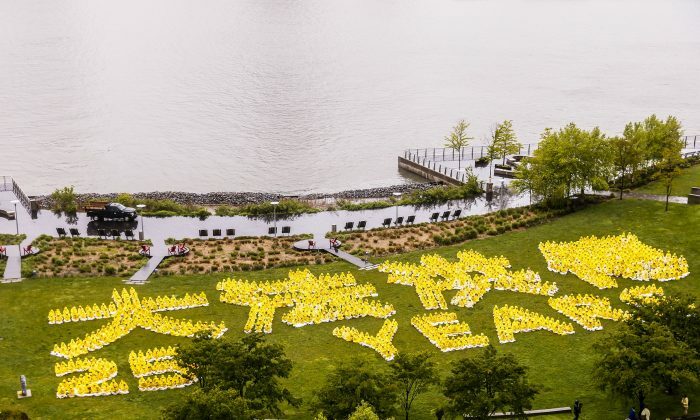 The thousands who took part in this year’s character formations are among over 10,000 Falun Gong practitioners who came to New York to participate in activities surrounding the May 13 anniversary, which is known as World Falun Dafa Day. Around 1,000 joined an arts event at Union Square on May 11; the next day, 10,000 people rallied at the Dag Hammarskjöld Plaza near the United Nations headquarters to protest the persecution in China and showcase Falun Gong’s worldwide reach. Six thousand five hundred practitioners, hailing from 57 nations and regions, marched in a parade to the Chinese Consulate on the other side of Manhattan. For Jian Tang, a Chinese-American practitioner living in Houston, the event was a reminder of how Falun Gong practitioners have thrived despite many years of persecution. Tang, a new practitioner when the persecution started in 1999, travelled back to China that November specifically to take part in an appeal to the communist regime in Guangdong Province. Tang and other practitioners were arrested. After spending 15 days in detention, Tang was fortunately released with the support of local U.S. media in Colorado, where she was residing with her daughter Shaoshao at the time.